After graduating from the Slade School of Fine Art and the Princes Drawing School in London, I was looking to further my artistic interests abroad, with the idea of immersing myself in a very different foreign culture, to create a new body of work. Being naturally drawn to large cities, and having a growing interest in Japanese arts and culture, Tokyo had a particular draw for me, and this led me to successfully apply for scholarships from both The Daiwa Anglo Japanese Foundation and MEXT, giving me a number of years in Japan to concentrate on my work. During my time in Japan, I completed a Masters and Doctorate in Painting at Tokyo University of Fine Arts, and learnt how to function using the Japanese language. At the end of my time at the university, I was awarded the 2011 Nomura Art Prize for the best Doctorate paintings, with a painting of mine being bought for the permanent collection of Tokyo Geidai Art Museum. My extended period of time in Tokyo was used to develop my interest in cities and portraiture. Some of my work depicts densely packed groups of faces, inspired by the crowds of Tokyo. Painted mainly in monotone using a variety of materials (oil on canvas, acrylic on canvas, Japanese ink on Japanese paper), they are a response to urban issues such as overpopulation, isolation, community, and the anonymity of the city dweller. Many of these works show groups of people occupying the same close public spaces, yet also isolated from one another - a phenomenon that can be seen in large cities such as Tokyo. 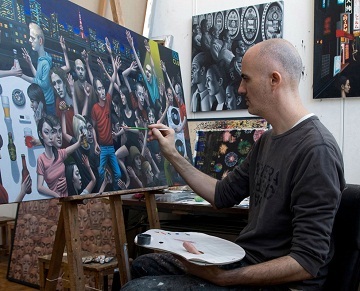 Carl Randall in his studio at Tokyo University of Fine Arts. One of these works, ‘Mr.Kitazawa’s Noodle Bar’ (an oil painting based on a ramen shop in Tokyo I sometimes visited), will be exhibited at the BP Portrait Award at the National Portrait Gallery in London as one of 55 paintings selected from 2200 entries, from 21 June to 23 September 2012. The exhibition will then go on tour to the Scottish National Portrait Gallery, Edinburgh (3 November 2012 to 27 January 2013), and the Royal Albert Memorial Museum, Exeter (9 February to 19 May 2013). 'Hibakusha Portraits', a series of six drawings of survivors of the atomic bomb made in Hiroshima Japan, was also exhibited in the Royal Society of Portrait Painters annual exhibition this month at the Mall Galleries, London. Many of my Japan works are also due to be exhibited at my solo exhibition at the Daiwa-Anglo Japanese Foundation, Japan House, London (January to March 2014). In conjunction with this exhibition, a book of the Japan paintings and drawings is being made (with an introduction by writer Donald Richie). Further information about can be found at The Daiwa Anglo Japanese Foundation website here.